Who is Jesus to you? If someone asked you, who would you say Jesus is? Along with Peter I can say that I know Jesus to be the son of God, the Messiah. I can say this because I know him. There are many people who know of him and will happily say "the Bible says he's the son of God" or "it is said he is the son of God". If a person has not accepted that truth and come into relationship with Jesus, it is very hard for them to say, with any meaning, that they know he is the son of God. The words feel false in their mouth and make them uneasy. When we come into relationship with Jesus we know him, we know who he is, what he has done for us and how he works in our life. What is it that gives us that confidence to be able to declare Jesus as Lord? Jesus explains in verse 17, you know Jesus through God's revelation. God has given you a heart to understand and he reveals to you the true person of Jesus. You have been blessed with the favour of God. He has chosen to reveal his Son to you, he has invited you into his family and into a relationship. When I was baptised, and no doubt this is common in many adult baptisms, I was asked to make the good confession, to say out loud "Jesus is Lord", this is not just words it is a declaration of the heart. I am saved by the confession of my mouth and the knowledge in my heart of who Jesus is. (Romans 10:9). In any relationship you are able to declare with confidence who someone is, where they come from, what they're like and why you are friends. This is the relationship that Jesus wants with you. He did not ask Peter "Who do you say I am?" because the answer would make him feel good or he wanted to be bigged up by his title. He knows that as we speak the words they connect with our heart. It is a God revealed knowledge that connects with the heart not just the head. Speaking out Jesus' name, who he is and declaring his glory is good for your soul. The revelation of who Jesus is and what he has done for us, gives us confidence in him. Look through the Psalms; in upset, anger and frustration the psalmist declares God's glory, why? Declaring it gives you strength (73:6), it reminds you of all he has already done (77:12), it gives you hope (62:5). Jesus wants to pour out every good blessing on you, he wants you to live life to the full and he does that by bringing you into a deep relationship. Can you declare that Jesus if Lord? Do you still sing his praises when everything is going wrong and you're feeling hurt, angry or upset? 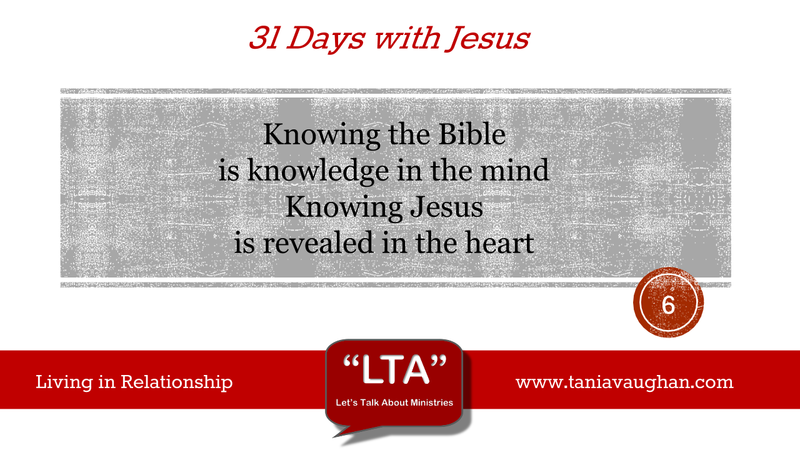 Will you open your heart to the revelation of who Jesus is? Lord, thank you that your revelation is not just words in my head but a knowledge in my heart. Thank you for bringing me into your presence so that I can know your son as saviour and friend. Lord, help me to let you in through all circumstances by giving me a heart to praise your name and declare your glory no matter how I feel. JC was not daft - there is power in proclaimation! in the same way that by sharing a fear or asking someone to by your accountability partner, in relation to an addiction for instance, breaks the hold the enemy has over that part of your life - the Devil understand that by being ashamed of something you are not dealing with it and it is a barrier between us and JC, and the devil loves that!. Words are powerful - elsewhere JC talks about the fact that the tongue steers the body like a rudder can steer a big ship. Declaring that JESUS IS LORD we are not only stating to all we are in Him but we are also opening ourselves to spiritual attack - The Devil hates anything that takes us closer to God! The precious gospels - love them, love Jesus!